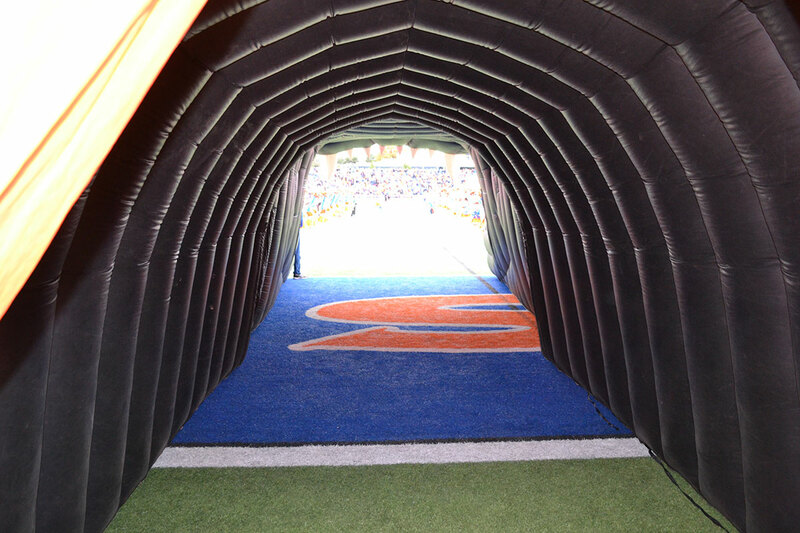 Peering through the tunnel at the beginning of the game. SAN ANGELO, TX — High school football teams are gearing up for the 2017 football season, so is San Angelo LIVE! We will be out at games across the Concho Valley and west Texas covering your teams as they hope to make it to Arlington in December. The San Angelo LIVE! Game of the Week: We will introduce the new LIVE! Game of the Week. Each week, our staff will pick a game with the most significance to go cover. For that game, our coverage will include a preview of both teams in the matchup, live video clips and interviews on-site, as well as a post game recap. Multiple Games Covered Each Week: If your team didn't get Game of the Week honors, don't worry. We're going to hit the road hard in order to bring you the best coverage that you've come to expect from San Angelo LIVE! We'll have updates from all around the Concho Valley and two additional games covered live on site. Preseason Previews: During two-a-days, we are churning out previews for teams in the San Angelo area. Keep an eye out every day for your team. Teams that we have already previewed: Lake View, Christoval, Irion County, Veribest, Miles, and Paint Rock. Football, especially high school football, drives Texas. That's why we want 250,000 readers tuned in to us to get their updates each week throughout the season. San Angelo Central: The Bobcats had a tremendous season in 2016 and look to build off the momentum from that season. It won't be easy, by any means, with the Bobcats losing a handful of key contributors on both sides of the ball. A player to watch is Maverick McIvor as he moves from receiver to quarterback this season. It'll be interesting to see how he adjusts to the leadership role. Central should compete for another district title, and if there’s a regular season event to look out for, it will come down to their home game against Odessa Permian. Wall: After a state semifinal appearance a year ago, the expectations are high, especially with a big group of returning starters. Houston Guy has built a tradition in Wall America. That tradition, coupled with the 15 starters returning, could spell another State Final berth in 2017. The player(s) to watch for the Hawks are actually a trio of running backs in Tymber Carr, Casey Braden, and Drake Hollifield, who combined for just over 2,000 yards last year. Wall has a team that could win a state championship this year, but a seemingly inevitable playoff meeting with Brock is all that stands in their way. Miles: The Bulldogs aren't favored to make a deep run into the playoffs, and that's exactly how Head Coach Chad Currie likes it. The Bulldogs went 5-6 last year and snuck into the playoffs. This year he returns 14 starters to the field. Look out for Jonas Garcia on this Miles squad as he transitions from running back to quarterback after Ross Kalina decided to focus solely on baseball. Miles still brings a very tough ground attack to the table,but they will need to get through Albany in the regular season and district 5-2A D2 in the playoffs. Be sure to check our social media daily for your team's news! Follow us on Twitter and Facebook.